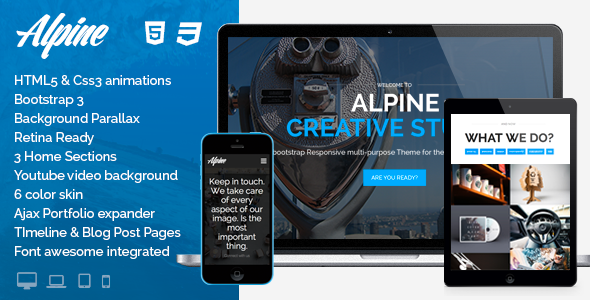 Alpine is a Bootstrap Responsive multipurpose Theme parallax. Ultra responsive and easy to customize with a portfolio filters and the project expander is the best solutions for the Creatives, Web agency and more! 2 Home Section versions Alpine includes 2 header verisons. You can customize each of them very easy. You can choose between maxim age fullscreen slider o pattern flexslider. Isotope Portfolio We create a fullwidth 4 colums portfolio, that never breaks rows. Always display properly. We guarantee this! Browser Compatability This template supports all the major browsers including IE9+, Chrome, Safari, Firefox. Item Reviewed: Alpine - Responsive One Page Parallax Bootstrap Template 9 out of 10 based on 10 ratings. 9 user reviews.